A new art book exploring the modern legacy of a fashion collection conceived in Silicon Valley by internet trailblazer and collector Christine Suppes, presented in 300 pages by photographer Frederic Aranda with texts by the collector herself. Electric Fashion is the outcome of a five year collaboration between Aranda and Christine Suppes, a native Californian based in Silicon Valley, who has dedicated her life to promoting the fashion industry as a writer, editor, collector and supporter of young designers. 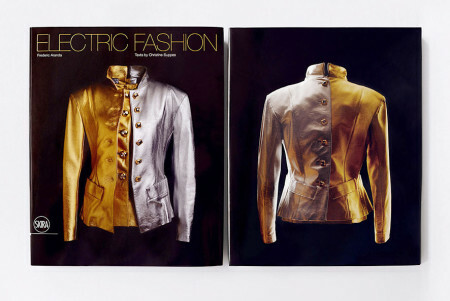 Electric Fashion’s rigorous documentation of three decades of fashion boasts a double vantage point: on the one hand, each garment is photographed in a studio setting to enhance critical academic understanding, while on the other it is shown worn by the collector herself to depict the garments as they were originally intended to be worn. The combination of these two approaches brings the collection to life while aiming to give a thorough understanding of the thought processes and motivations behind collecting. Distributed in the UK, Europe, Asia & Worldwide by Thames and Hudson Ltd. Distributed in the USA, Canada, Central and South America by Rizzoli International Publications Inc. and Random House.